Open, visual, artistic, uncomplicatedly cosmopolitan, unusual…There are many ways to describe Palma de Mallorca, but what is clear is that we are talking about a pearl of the Mediterranean which exudes a luxury bohemian atmosphere. To walk through this city’s streets is to experiment with a multisensorial experience in which art and culture are the undeniable stars. Our hotel in the centre of Palma de Mallorca is located in the true heart of the Mallorcan capital, in a privileged enclave. This is why we perfectly understand our surroundings and why we want to explain what you might find on a walk through our surrounding area. Do you want to know more? Brondo Architect Hotel will be giving you an in depth look in this blog article. 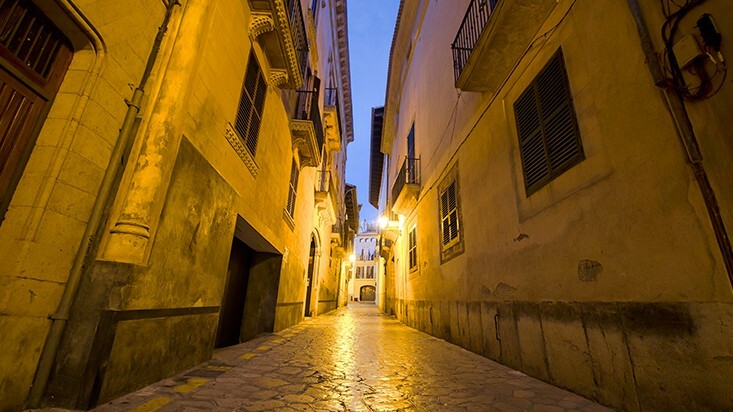 The area which surrounds our hotel in the old town of Palma de Mallorca is part of the roots of the city. Feeding through them is life and energy which supplies each and every one of the most magical corners of its centre. Walking its narrow streets is a complete adventure: you will discover urban art from the most progressive artists and you will hear songs from street performers who set the soundtrack to a community with hundreds of years of history. Also, it is an area where you are most likely to find modern art galleries, which only add to the delicate and contemporary feel of big European cities. Our hotel, in fact, adds to this scene with an informally formal décor which elevates our guest’s stays in our rooms. Staying at Brondo Architect Hotel, our hotel in the old town of Palma de Mallorca, is a great way for art and culture lovers to spend a holiday. Our hotel in the centre of Palma de Mallorca has 30 designer rooms which are nothing like you’ve seen before. The location and the very tasteful decoration of the spaces make the unusual experience for our clients be enshrined in their memory and their five senses. The terraces only multiply this experience: deemed one of the most valued features by those who have been able to sleep amongst our four walls, are the terraces of Brondo Architect Hotel which are spaces filled with vegetation and colour. You will also find Balinese beds, thematic breakfasts at the foot of your bed and an opening to the terrace which gives a sense of freedom and at the same time allows the natural light to flow in. Surprise that special someone at our hotel in the old town of Palma de Mallorca. Or surprise yourself. We want you to soak up the art and culture of this marvellous island, starting with our installations and ending with any of the streets which surround us. Do you have a query? Would you like to make a reservation for our hotel? You can do so by contacting us via telephone +34 971 72 05 07 or via email at booking@brondoa.com. We want you to take away a visual and unusual memory. Come to the centre. A UNIQUE AND SINGULAR CHARACTER, WHERE THE OLD AND THE NEW COEXIST IN HARMONY.